Leo Sosa, Founder and CEO of devMission, received the Digital Champion Award for his dedication to digital inclusion. Leo is someone I’ve known for over a decade. He has tirelessly worked to help people in underserved communities get access to computers, the internet, and skills they need to reach their goals. Michael Wiggins received the Digital Changemaker Award. As a CTN volunteer, he has made exceptional impact on digital inclusion. Michael has volunteered for us since 2016 and has built strong relationships with his regular learners. At St. Francis Living Room, he has essentially become a program manager for our tablet program. Watching him grow learner confidence is truly inspiring. 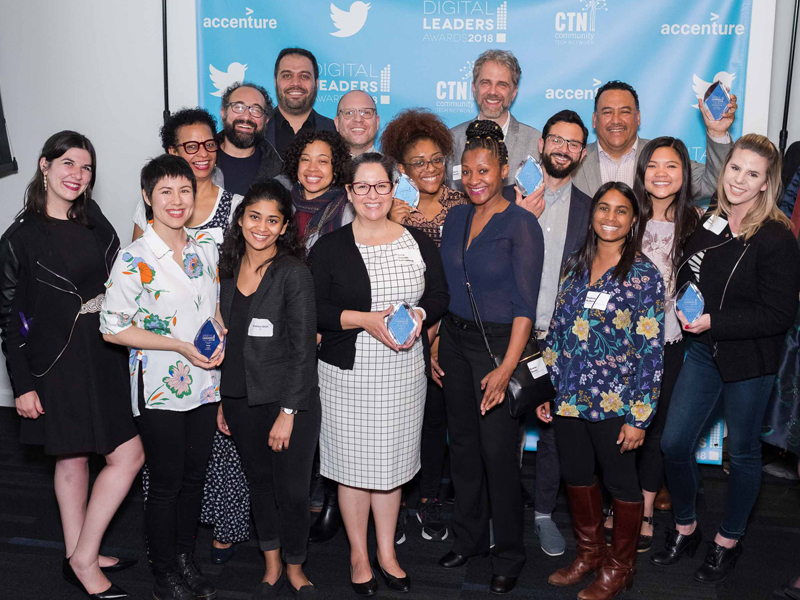 Omid Kahzie and his team at St. Anthony’s Tenderloin Tech Lab received the Digital Inclusion In The Community Award for their devotion to supporting their community’s goals through digital inclusion activities. They have been a leader in the space for well over a decade, and I have always been impressed with how they thoughtfully respond to the needs of their community and adjust their programs and services accordingly. Barry Roeder (MOHCD) and Zach Berke (Exygy) together received the Digital Bridge Builder Award for the development of DAHLIA San Francisco Housing Portal. We understand that new computer users are challenged by complicated websites that are difficult to navigate. We selected DAHLIA because not only does it meet a need in the community — finding and applying for affordable housing — it was also designed to be easy to use both on a computer and on smart devices. London Lee and Holly Livolsi from Twitter accepted the Digital Amplifier Award. Twitter was selected because of their contribution both to digital inclusion and to helping families thrive. Their grants, volunteers, equipment, and space have helped dozens of nonprofits, including CTN, throughout San Francisco. A final thank you to our sponsors Twitter, Accenture, AT&T, Monkeybrains, Cornerstone Advisors, Zelle, Polsinell, Sprint, and Microsoft!